« County Parks: Stewardship Fund an Option? Public art was featured in two specific agenda items. One was a presentation of the annual public art plan given by Wiltrud Simbuerger, a member of the city’s public art commission. The council gave the presentation a basically positive reception. But the second agenda item required a vote – on a $150,000 piece of art proposed by Ed Carpenter, to be hung in the lobby of the new Justice Center. The city’s public art commission had selected Carpenter from responses to a request for proposals. 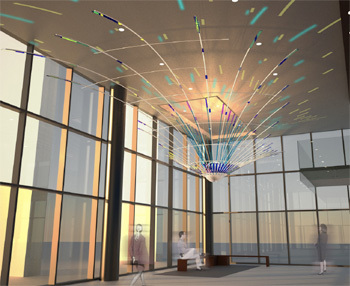 A vote on the artwork, a piece called “Radius,” had been postponed from the council’s April 2, 2012 meeting over concerns about public access to the Justice Center lobby, where the sculpture will be hung. A nearly one-hour debate unfolded about the Carpenter piece, with the specific artwork serving as a kind of proxy for a rehash of previous council debates on the city’s Percent for Art ordinance. The ordinance requires that all city capital improvement projects include 1% for public art, up to a cap of $250,000 per capital project. For capital projects that aren’t suitable to have public art incorporated into them, the 1% is “pooled” for use in some other public art – which must be related to the purpose of the funding source. For example, the fountain outside the new Justice Center, designed by German artist Herbert Dreiseitl, is funded with money pooled from 1% of some sanitary sewer projects, drinking water projects, and stormwater management projects. Jane Lumm (Ward 2) proposed an amendment that would have canceled Carpenter’s project and appropriated the art project funds to invest instead in the city hall building. That amendment failed, but piqued mayor John Hieftje into announcing that he’d be sponsoring a future resolution to take $50,000 from public art funds, and deposit that amount into the general fund. That move is susceptible to the same critique made by several councilmembers as well as the assistant city attorney against Lumm’s amendment: The public art ordinance prohibits transfer from public art funds to other funds. 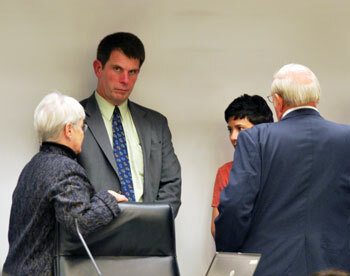 Stephen Kunselman (Ward 3) stated that he would be content for the council simply to violate that ordinance. Carpenter’s sculpture eventually was approved over the dissent of Kunselman and Lumm. Besides public art, the council approved the city’s portion of the State/Ellsworth traffic roundabout project, which includes an improvement for a water main connection – to pipe water from a well on the property of Ann Arbor’s municipal airport to the city’s water treatment plant. The airport also made it onto the agenda in the form of a resolution that settled outstanding legal issues surrounding the construction of hangars on the property. Prompting extended discussion by the council was a resolution that invalidates sidewalk occupancy permits for vendors in a specific area around Main Street between Huron and William, whenever Main Street is closed down for special events. The council delayed action on a tax abatement for the battery technology company Sakti3, pending review by the city council’s budget committee. And the council authorized another five-year extension of its contract with Waste Management to haul the city’s trash to a landfill. The council also heard its usual range of public commentary. The public hearing on the fiscal year 2013 budget enjoyed light participation. The council will vote on that budget, and any amendments, at its May 21 meeting. The council had two public art-related items on its agenda: a presentation of the art commission’s annual plan, and the approval of a $150,000 sculpture for the new Justice Center. Submission by the public art commission of an annual plan to the city council is a requirement of the city’s public art ordinance. The council received a presentation on the public art commission’s annual plan from Wiltrud Simbuerger, a member of the commission. The city’s public art commission had discussed the public art plan for FY 2013 at its March 28, 2012 meeting. The plan describes projects that AAPAC intends to work on between July 1, 2012 and June 30, 2013. [.pdf of FY 2013 annual public art plan]. Develop a master plan for 2013-2016 that will create community engagement and expedite work of the commission. Advance the following projects that are underway, meeting all deadlines. All the projects have task force oversight, approved budgets, and are in various stages of completion. The projects are: (1) installation of Ed Carpenter’s “Radius” sculpture in the lobby of the Justice Center by November 2012 ($150,000); (2) a mural in Allmendinger Park by Mary Thiefels, to be completed by September 2012 ($12,000); (3) two additional murals by August 2013 ($40,000); (4) artwork for a rain garden at Kingsley and First by August 2013 ($27,000); (5) artwork for the East Stadium bridges by the fall of 2014 ($400,000); and (6) installation of artwork in the Detroit Institute of Art’s Inside|Out project by the spring of 2013 (budget TBD). That project involves installing framed reproductions from the DIA’s collection at outdoor locations on building facades or in parks. By June 2012, identify and prioritize new projects for FY 2013, allocating existing funds using agreed-upon criteria of type, location, and community involvement. The criteria will be defined during the master planning process. By Aug. 1, develop and begin to implement an effective communications plan about the uses and value of public art and the operation of the commission. Collaborate with commissions, organizations, and agencies to accomplish public art projects. The first objective – developing a master plan – included details on its purpose. The intent of the master plan is to: (1) guide AAPAC’s efforts to include public art throughout the city, involve community groups and create substantial visibility for public art as an integral part of community life and a city asset; (2) train commissioners and task force members with the goal of increased community knowledge, engagement and advocacy for public art; and (3) better integrate the public art administrator with every city department with the goal of increasing public art in the city. Simbuerger concluded her presentation by thanking Aaron Seagraves, who provides staff support to the city’s public art commission as the city’s public art administrator. Jane Lumm (Ward 2) asked about the public art budget and request for proposals that’s connected to the East Stadium bridges project – $400,000. Simbuerger clarified that the 2014 date in the annual plan was not the date that the RFP would be issued, but rather the date of anticipated completion for the public art associated with the bridge project. The RFP is currently under review by the city attorney’s office, Simbuerger explained. Lumm said the reason she was asking about it is that a lot of people see architecture as art. The Broadway bridges are like that, she ventured. She said she’d been told that the East Stadium bridges can’t be that nice, because there’s not enough money. She wondered if art could be incorporated into the bridge design. Simbuerger indicated that the bridge design is done, so there’s some room for flexibility on only a few things, like railings or sidewalks. The art commission can’t influence the basic design of the bridge anymore, she said. Art could be added to the bridge, she said, and there’s also a park next to the bridge as well as a fence that leads up to the bridge along Stadium Boulevard – which could potentially serve as locations for public art. Lumm concluded her remarks by commending the planned mural project at Allmendinger Park, for involving the community. The project, by local artist Mary Thiefels, will incorporate found objects into a mosaic on the pillars of the park’s bathroom building. Later in the meeting, Lumm cited those earlier remarks she’d made – to argue against mayor John Hieftje’s contention that she was attacking public art. That discussion centered around the second public art-related agenda item – approval of a $150,000 piece of art for the lobby of the new Justice Center. The Justice Center is also known as the police-courts building. The overall construction project for the new building, which connected city hall with the new Justice Center, is also known as the municipal center building project. The proposed public art project would be located in the lobby of the new municipal building called the Justice Center – on the northeast corner of Huron Street and Fifth Avenue in downtown Ann Arbor. The Justice Center houses the 15th District Court and the Ann Arbor police department. The sculpture is called “Radius” by Ed Carpenter of Portland, Oregon. Previously council had postponed approval of public art funds for Carpenter’s project at its April 2, 2012 meeting. Because it houses the district court, the building features airport-style security measures at the entrance, and visitors must surrender electronic devices like cameras and cellphones to be locked in cubicles during their visit to the building. Concern about accessibility by the public to the public art was the subject of councilmember deliberations that led to the postponement on April 2. The council expressed interest in using the delay to explore the possibility of moving the security screening to a point well past the entrance in the interior of the building. The visibility of the proposed sculpture from outside the building was also a point of discussion at the April 2 as well as at the May 7 meeting. At the May 7 meeting, before the council began its deliberations on the Justice Center lobby art, city administrator Steve Powers indicated to the council that the question of public access to the lobby and art had been reviewed by city staff. He suggested that he was prepared to go into detail on that issue, or that the information could be reviewed by the city council’s building committee. He noted there are some details on use of the building by the police department that have an impact on its 24/7 accessibility. Powers also said that staff had some answers about the visibility of the art itself from the exterior of the building. The visibility of the art and the accessibility to the building, he said, are two separate issues. He noted that moving the security checkpoint would have a budgetary impact. At its Jan. 25, 2012 meeting, the Ann Arbor public art commission had unanimously recommended selecting Carpenter for the $150,000 project. A task force had recommended the selection of Carpenter’s proposal from three finalists. 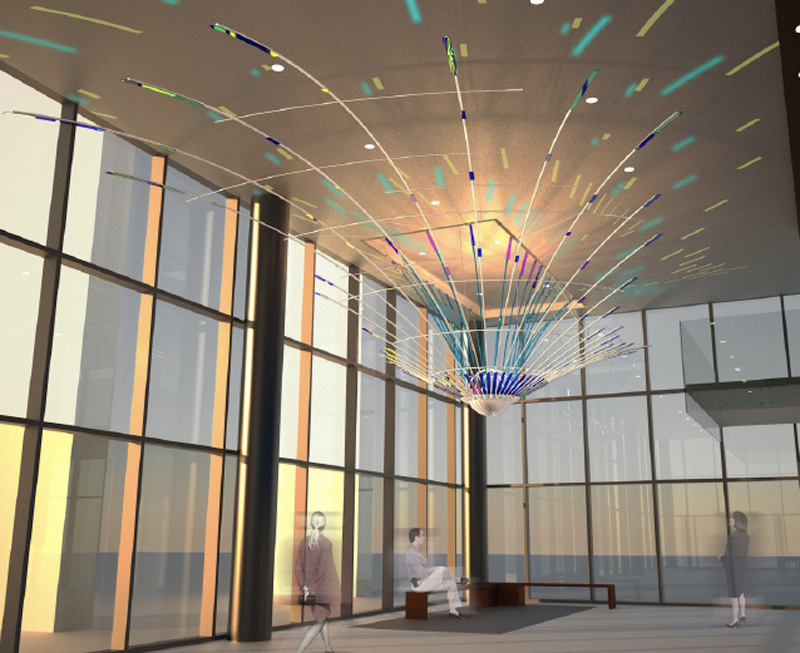 Carpenter plans to create a hanging sculpture of dichroic glass, aluminum, stainless steel and lighting, including LED spot and flood lighting. Among the reasons for recommending Radius, the task force cited the sculpture’s metaphor: That the activities in the Justice Center have a “rippling” effect throughout the community, which echoes the water sculpture by Herbert Dreiseitl that’s located in the plaza outside the building. Ann Arbor’s public art funds come from the application of the city’s Percent for Art ordinance, which requires that 1% of all capital projects (up to a limit of $250,000 per capital project) be set aside for public art. By way of background, the ordinance describes two ways that pieces of public art can be funded. They can be funded as pieces of art that are integrated into or stand on the site of some capital improvement project. The budget of all such projects must include 1% for public art. (3) Funds for public art that are included as part of a capital improvement project financed from a City fund other than the City’s general fund shall be accounted for within that fund and may be used as part of that capital improvement project for the creation, purchase, production or other acquisition of art incorporated as a part of the capital improvement project, including art located on the site where the project is located. (4) Funds for public art that are included as part of a capital improvement project financed from a City fund other than the City’s general fund may instead be pooled in a separate public art fund within that fund. Public art funds that are held within a city fund other than the general fund shall be expended only on projects that are related to the purposes of that fund. (5) Funds in pooled public art funds may be used for the creation, purchase, production or other acquisition of art for display in public spaces or facilities; for extraordinary maintenance, repair or refurbishment, including structural reconstruction, and for relocation, alteration and removal of public art. The funding strategy for the Carpenter sculpture contrasts with that of the Dreiseitl fountain, which used “pooled” funds. The fountain had an initial budget created from pooled funds from other capital improvement projects – projects that were paid for out of drinking water ($210,000), sanitary sewer ($510,000) and stormwater ($30,000) funds. In contrast, the Carpenter sculpture is funded from the Justice Center (aka police-courts or municipal center) building fund. The amount initially available for public art from that project was $250,000. One percent of the project budget would have been more than $250,000, but the ordinance caps the total public art allocation from any project at $250,000. That building fund stemmed from various sources. At the council’s Nov. 21, 2011 meeting, then-public services area administrator Sue McCormick said that ordinarily, city staff would not go back and trace how much of that $250,000 could be attributed to various sources. However, because they’d been asked to do that by councilmembers, McCormick said that of the $250,000, around $50,000 could be “associated” with the general fund. That $50,000 was a number batted back and forth by councilmembers at their May 7 meeting – it’s the amount that mayor John Hieftje said at the meeting that he wants to take out of public art and put back into the general fund. He said he wanted to settle that issue once and for all. 1:835. Disbursement of public art funds. (3) Funds for public art that are included as part of a capital improvement project or that are part of a pooled public art fund may be not be transferred to any other fund, encumbered or utilized for any purpose except the purposes specifically set forth in this chapter. Stephen Kunselman (Ward 3) indicated that he did not believe it is necessary for the council to follow its own ordinances. Ordinances are there for the staff to follow, he suggested, not for the council. Major John Hieftje opened the council deliberations by saying he’d be happy to vote for approval of the piece of art that evening, leaving the issue of access to the lobby for future resolution. City administrator Steve Powers. Behind him is a poster for the getDowntown Commuter Challenge, which runs through the month of May. Marcia Higgins (Ward 4) indicated that her concern, dating back to a few weeks ago, was not about the art, but rather the use of the lobby space in the Justice Center. She’d talked with city administrator Steve Powers about the issue. She said she was not opposed to voting for the artwork; however, she was concerned about the possibility that the council’s building committee came back with a recommendation to change significantly the use of the lobby space. Will that piece of art still be the right piece of art for that location? She said she had every intention of asking that a council building committee be re-appointed. Higgins asked interim public services area administrator Craig Hupy about possible changes to the use of the lobby space – to use more of the floor area in a utilitarian way. Hupy indicated that the piece of art is suspended from the ceiling, so it’s well above the floor space. His concern would be with the lighting of the piece. Public art administrator Aaron Seagraves explained that there’s internal lighting as a part of the artwork itself. Higgins asked if the building committee determines that the proposed location in the lobby would not be the best place for the sculpture, is there another spot in the building where it could be installed? Seagraves indicated that for a suspended piece, that corner of the lobby is the best, or the only location, because there’s a drywall recess there – the rest is a plaster ceiling. It’s also the most visible corner, he said. He suggested it would be an option for the public art commission to fund an additional piece of art for the Justice Center. Sabra Briere (Ward 1) indicated that the piece of art has been designed to be viewed from outside the building. She noted that the location of the art is dependent on its size, so she asked if there’s a basic diameter for the sculpture. From the center to its farthest point, Seagraves said, the piece is 37 feet. Briere followed up by asking if the piece is “circular.” Yes, said Seagraves. Based on some ensuing confusion, it was clear that Briere intended the question to include the symmetric properties of “circular,” not just the rounded qualities. Briere ventured that the piece was 74 feet across – no, said Seagraves, more like around 50 feet, because it’s not symmetric. [It's not clear if the participants in the exchange appreciated the irony of the name of the piece – "Radius."] Briere wanted to know if it would fit into the city hall building [which is adjacent to the Justice Center.] Hupy indicated that it wouldn’t be a matter of just moving the artwork over to another building – the suspension points would need to be adapted. Briere ventured that the piece of art had been designed specifically for the proposed location, a sentiment with which Hupy agreed. Sandi Smith (Ward 1) said her initial concern had not been about the piece of art itself or where it is located. Rather, her concern was about the intended use of the Justice Center lobby and the ability of the public to see the art from inside the building. That had been the reason she’d asked for the postponement of the issue, she noted. Smith wondered if reappointment of the building committee would be needed or if city staff would be prepared to answer those questions about use and access. Powers noted that there is currently 24/7 access to the Justice Center lobby. After hours, people can be buzzed in by the police department. Staff has looked at options of downsizing the footprint of the security checkpoint and relocating it. However, there are budgetary and space challenges, he said. There are four or five different options than can be provided to the city council or to a building committee of the council, Powers said. Tony Derezinski (Ward 2), who serves on the public art commission, indicated that the piece of art that’s been chosen, the work by Carpenter, is intended to hang in that specific spot. He felt it’s a beautiful use of the building. Jane Lumm (Ward 2) said she couldn’t imagine people needing to be buzzed in to see the art. She said she wanted to see renderings of the sculpture as viewed from outside the building. Based on what other councilmembers had said, she thought it didn’t sound like the council was heading toward postponing again. She said she’d be fine with appointing a building committee. Lumm gave as background to her amendment her understanding of the city hall (Larcom building) renovation project. The bathrooms in the basement and the first floor had been upgraded as part of the municipal center project, she said. But there was no money in the building fund budget for bathroom renovations on other floors. So those renovations would be funded out of general fund money over two years, through the facilities budget in the public services unit. Tony Derezinski (Ward 2) reacts with body language to the proposal by Jane Lumm (Ward 2) to cancel the $150,000 Justice Center lobby art project. Lumm noted that the council had approved the first phase of the upgrade to bathrooms on other floors at the council’s April 16, 2012 meeting – at a cost of $93,438. Another $165,000 is needed for that project in 2013, she said. The community has been told that no general fund dollars were used on the municipal center, Lumm contended, so she proposed that the public art project be canceled. The $150,000 budget for that public art would, according to her amendment, go back into the municipal center building fund. The bathroom would then be funded out of the building fund. Higgins said she did not consider those upgrades to be a continuation of the municipal center building project. The bathrooms that were renovated in conjunction with the municipal center renovation were done because of the installation of the new elevator, she said. The renovations now being done in addition are standard upgrades, she said, like those that would be done in any other facility. She appreciated the idea of canceling the art project, but would not support the amendment. Briere asked under what circumstances the council can cancel a project and reallocate the dollars. Assistant city attorney Mary Fales clarified the funds from a canceled art project have to be reallocated to another art project. Kunselman, Briere, Hupy and Lumm then engaged in a conversation about the original source of funds for the artwork. Seagraves told them that the Justice Center lobby sculpture by Ed Carpenter didn’t come from pooled funds, but rather from the municipal center building fund. Hieftje stated that not all the funds generated for public art from the municipal center building fund [a total of $250,000] are general fund monies. He allowed that hypothetically, $50,000 of that $250,000 may have originated as general fund money. Hupy noted that the funds for the Justice Center came from a multitude of funding sources beyond just the general fund – that would have to be analyzed to identify the specific contributions. The city’s chief financial officer, Tom Crawford, essentially agreed with Higgins’ earlier description of the bathroom renovations as not part of the scope of the municipal center building project. There’s been a lot of deferred maintenance on the building, he said. One of the expectations is that there’d be a higher level of regular maintenance needed. Kunselman wanted to revisit the issue of the theme of Carpenter’s sculpture – to which fund’s purpose was the art’s theme related? Seagraves reiterated that it wasn’t funded with “pooled funds,” so there’s no requirement that it be related in theme to some specific fund’s purpose. It was funded out of public art money generated by the center’s building fund. Based on some remarks by Crawford, Hieftje said he’d be interested in a resolution to take $50,000 and put it into the general fund – to resolve the question of whether general fund money was used for public art. Carsten Hohnke (Ward 5) tried to achieve some clarity on the question of what the legal, possible uses of the sculpture’s budget would be if the project were canceled. He ventured that even if the sculpture were voted down, the money would be required to be spent on public art. So he concluded that the whole notion of monies going back and being applied for a different purpose would be tantamount to overturning the Percent for Art ordinance. Given that the money could not be spent on something other than art, Hohnke asked Lumm what the point would be of canceling the sculpture for the Justice Center lobby. Lumm indicated that the point was so that the money would not need to be spent on a piece of art. Hohnke responded by saying that as long as the Percent for Art ordinance is on the books, what Lumm is saying simply isn’t true. Crawford confirmed that once money goes into a specific fund, it’s not just a normal budget action – once the money gets into that fund, it has to be used for that purpose. Briere responded to Lumm’s amendment by saying that it could be reduced to three questions: (1) Should the sculpture be canceled? (2) Can money allocated to the public art program be allocated to a different capital improvement project? (3) Does either of those reflect support for public art? With respect to the first question, Briere said that if the council voted the project down, that would cancel it. With respect to the second question, she felt that it wasn’t legal to reallocate the public art money in the way Lumm wanted to. Smith added a fourth issue, which was an attempt to revisit the decision to build the Justice Center: “I gotta say, it’s there and it’s operating!” Reflecting on the Larcom building’s age, and the need to renovate bathrooms, she ventured that at 49 years of age things start to break that need to be fixed. Higgins noted that the money that’s been budgeted has to be used on public art, even if the project is canceled. She thought the city has spent enough money on art at the Justice Center location – given the Dreiseitl sculpture. She suggested some other location in the city could be found. Kunselman agreed that too much money had been spent on art at the Justice Center and repeated his belief that the Justice Center lobby sculpture budget had drawn on water funds, given the allusion to the “rippling effect” the sculpture was supposed to have. He observed that bathrooms also have a theme of water. Kunselman then stated that although the public art ordinance is an ordinance, the council did not need to follow its own ordinance. Hieftje picked up on Derezinski’s earlier point, by stating that it would be a more honest approach to attack public art directly instead of the way that Lumm was proceeding. The council had twice before had that direct debate, he said. Hohnke added that if the council wanted to cancel the project, as Lumm’s amendment stated, then the council could just vote the project down. Outcome on the amendment: Lumm’s amendment canceling the project and reallocating the money to renovate bathrooms failed, with support only from Lumm and Kunselman. Lumm responded to Hieftje’s characterization of her lack of support for the specific project as an attack on the public art program. She felt that was “an outlandish claim.” She pointed out that earlier in the meeting, she’d asked questions regarding the East Stadium bridges project about incorporating art into that project and had praised the Allmendinger mural project. She allowed that she’d voted in the past to reduce the percentage allocation in the public art ordinance. But her opposition to the project was not based on opposition to the public art program, she said, but rather based on how much the city is spending on the Justice Center building. She expressed her disappointment that the artist who was selected was from out-of-state. Hieftje responded to Lumm by saying it wasn’t a vote against the project that he was calling an attack on the public art program, but rather Lumm’s attempt to reallocate the public art money to a different purpose. Mike Anglin (Ward 5) had opposed the construction of the Justice Center. But he noted that the proposed piece of art was different from the history of that building. He stated that as long as the Percent for Art ordinance exists, councilmembers should support public art. He described how someone could get access to the lobby after hours by getting buzzed in by police. He said the issue of better access could be pursued in the future and it’s important to do that. Given the amount of money that had been spent on art on the site, it’s important to figure out a way to draw the public in to view the art, he said. Kunselman was not inclined to accept the idea that because the council had previously discussed the issue of the public art ordinance, the council could not or should not continue to discuss it. “We’re always going to be talking about this.” People could say it’s been discussed and voted on and that the majority rules and that councilmembers need to move on – but he cautioned against that. “Every council is different and there will be new councilmembers and this discussion will carry on for years until a methodology of funding public art is done that can be universally embraced.” He mentioned the possibility of a millage just for public art, or the removal of restricted funds from the public art program. Kunselman indicated he would not support the project. Among the reasons he gave were horizontal bands of etched glass on the windows that won’t allow people to see it from outside, he contended. Smith said she’d support the art project, but wanted to see the issue of the security checkpoint addressed as well. 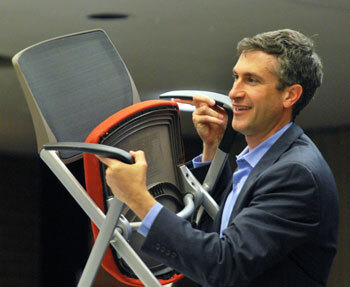 Christopher Taylor (Ward 3) rearranges a chair before the May 7 meeting started. Briere said that for her, the issue is whether the lobby can be casually available for a group of visitors who don’t want to go through the security checkpoint, emptying their pockets and taking off their shoes. Part of the reason that’s unclear is that there’s a cost factor involved, she said. She feared that the council would approve the art project, only to discover that the council is not also willing to fund the cost of making the art accessible. Briere was not willing to let go of the concept that the lobby to the Justice Center should be available to the public. For that reason, she hoped to have the cost information available before the council votes on the fiscal year 2013 budget – a vote that will be taken on May 21. She said she is not against this piece of art, and she believes it can only be observed well from inside the building. Hieftje indicated he’d support the piece of art, but also said work needed to be done on opening up the lobby of the Justice Center to make it more accessible. He mentioned three different receptions that have been held in the lobby without the security checkpoints. Christopher Taylor (Ward 3) indicated he’d support the artwork. But he wanted to address the issue of the “ownership” of the building. He said it’s been suggested that it’s only a limited few who benefit from the building – that it’s city workers and councilmembers around the table who benefit from changes to city hall. He disputed that wholeheartedly. He said it’s obviously core public space that is important to the city – of government, courts and police. It’s also the place people come to do a wide variety of business for various purposes, he said. Outcome: The sculpture “Radius” by Ed Carpenter was approved by the council over dissent from Lumm and Kunselman. 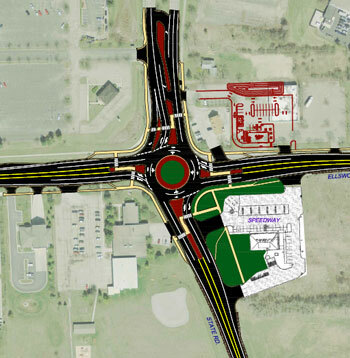 The council considered an agreement between the city of Ann Arbor and the Washtenaw County road commission for a $2.52 million roundabout project at State and Ellsworth. Of the total $2.52 million project cost, $2.17 million is for the intersection improvements per se, and the remaining $350,000 is for a city water main improvement. That will replace a 20-inch water main, which serves to pipe untreated water from the Steere Farms wells on the Ann Arbor municipal airport property to the city’s water treatment plant. The city of Ann Arbor is paying for the water main portion of the project as well as contributing $135,000 to the intersection improvement. The remaining cost is paid by the road commission ($135,000), Costco ($500,000) and a federal Congestion Mitigation and Air Quality (CMAQ) grant ($1.4 million). Costco is building a store near the intersection that’s expected to open this summer. Lumm asked Homayoon Pirooz, head of project management at the city, to review the background, which he did. He noted that State and Ellsworth is a very busy intersection. By way of background, the Washtenaw Area Transportation Study (WATS) website provides a database of traffic counts for various intersections. For example, data available from that database shows that the northern leg of the intersection of State and Ellsworth was studied in November 2009 and showed a total two-way, 24-hour count of 26,733 on the north segment of State out of the intersection. That compared with a two-way count of 17,566 on the south segment of State, measured about seven months later. To get an idea of whether those counts are a lot or a little, here’s how that stacks up with counts from another intersection that many drivers would likely consider “busy” – Main and Stadium. The most recent counts available from WATS date from over a decade ago, in 1999 – 23,957 for two-way traffic on the north segment of Stadium out of that intersection. Pirooz described the Washtenaw County road commission as having taken the lead on the project. He highlighted the jurisdictional issue – the fact that two legs of the intersection are locate in the city and two of them in Pittsfield Township. The two legs in the city are the State Street section north from the intersection and the Ellsworth section east of the intersection. Lumm ventured that the forum was well-attended. She wondered about the inclusion of provisions for non-motorized infrastructure, wiring for pedestrian activated crossing beacons. She allowed that Pirooz is the expert, but she had difficulty understanding how it’d be safer for pedestrians and drivers. The idea of a roundabout is that traffic is expected to flow continuously – but motorists might be expected to stop for pedestrians. She asked for an explanation if that’s typical. Pirooz explained that the roundabout is designed so there’s adequate distance between cars. He said that statistics of roundabouts show an improvement, measured by accident rates. He cited the new roundabout at Nixon and Huron Parkway as an example, noting there’d been concerns similar to Lumm’s that had been discussed before that roundabout was constructed. Pirooz explained that vehicles entering a roundabout are simply forced to slow down – you can’t go through a roundabout at 45 mph. He concluded that roundabouts are safer than standard signalized intersections. Tony Derezinski (Ward 2) added his personal observations, saying that he’d worked with Pirooz when some roundabouts in Ward 2 were first proposed – Nixon and Huron Parkway, and Geddes and Earhart. Derezinski said a lot of people who opposed the roundabouts came to believe in them. The traffic through Geddes and Earhart now flows through beautifully, he said. It really is “a win,” he said, and there’d been a couple of requests for more roundabouts. Pirooz commented that one of the new roundabouts is right at the entrance to Concordia University, and the school was concerned before construction about pedestrians on campus crossing the street to get to an athletic field. But the university is very happy with the roundabout, Pirooz reported, and feels that pedestrians are now safer. Marcia Higgins (Ward 4) said she appreciated the use of roundabouts and noted that everyone had likely driven through them. But the Ward 2 roundabouts have a different environment than the State and Ellsworth location, she contended. There’s a lot of truck traffic that goes through the State and Ellsworth intersection, she said. The proposed roundabout design is 150 feet in diameter. She wanted to know if that design took into account the size of the trucks that go through the intersection, noting there are many major corporations located south of Ellsworth on State. Pirooz responded to Higgins by starting to describe the alternative to a roundabout, which would be to add more lanes. Higgins interrupted Pirooz, telling him she was not asking for more lanes, but rather was just making sure that the entrances to the roundabout can accommodate trucks. Trucks add another dimension to the traffic challenge, she said, and there’s a tremendous amount of truck traffic that goes through the intersection. Higgins told Pirooz she just wanted him to tell her he’d look at that issue. Pirooz replied, “We have and we will,” and Higgins indicated that was all she needed. Pirooz indicated that he would expect trucks to be in the right lane as they navigated the roundabout. The roundabout is designed with the understanding there’s a large amount of truck traffic on the roads, he said. Outcome: The council unanimously approved the resolution on the State and Ellsworth roundabout. The council considered two change orders totaling $46,238 to resolve all remaining issues related to a lawsuit that CMA Design/Build Inc. had filed against the city in connection with the construction of hangars at the Ann Arbor municipal airport. The original contract was approved by the city council on May 5, 2008 for $2.39 million, of which $1.101 million was for the local share. Because CMA failed to complete the project, Ann Arbor terminated the contract and CMA’s bonding company, North American Specialty Insurance Co., finished up the work. CMA filed suit against the city; and one of CMA’s subcontractors filed suit against CMA. Claims by CMA involved costs it incurred due to stop work orders issued by Pittsfield Township (where the airport is located) over jurisdictional questions between the city and the township. Outcome: The council unanimously approved the airport hangar change orders. The council considered approval of the third five-year agreement since 2002 with Waste Management of Michigan – to dispose of the city’s trash in the Woodland Meadows landfill in Wayne, Michigan. For years 11 through 15 of the contract (2013 through 2017) the rates are as follows: $12.99/ton; $13.28/ton; $13.57/ton; $13.87/ton; and $14.18/ton. The increases reflect a 2.3% escalator. Responding to an emailed query from The Chronicle, city of Ann Arbor solid waste manager Tom McMurtrie explained that those rates don’t include the additional transfer charge of $12.12 a ton, paid to ReCommunity, which operates the city’s materials recover facility (MRF) and transfer station. According to the staff memo accompanying the resolution, the city disposes of 62,000 tons of trash in the Woodland Meadows landfill per year. The city’s street sweepings and seasonal wastewater treatment sludge are also disposed there. In 2002, the city council first approved the five-year contract, and then approved a five-year extension in 2007. Outcome: The council unanimously approved the contract with Waste Management. The council considered a resolution that, beginning June 1, 2012, invalidates sidewalk occupancy permits and solicitor/licenses for a specific area of the downtown on occasions when Main Street is closed for special events between William and Huron streets. The special events include, but aren’t limited to, the Taste of Ann Arbor, Rolling Sculpture Car Show, the Children’s Holiday Parade, Green Fair, and FestiFools. The resolution doesn’t apply to businesses that have been issued permits for permanent locations. Council deliberations were driven by a request from Sandi Smith (Ward 1) to amend the resolution. She did not want to allow the resolution to prevent the city from granting permits for use of the Palio parking lot at Main and William or the parking structure at Fourth and William. 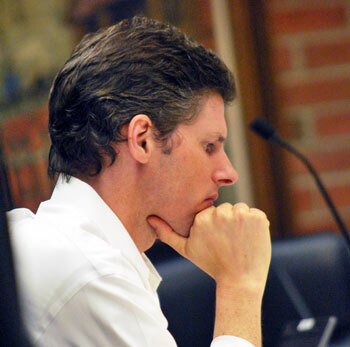 In the context of the Connecting William Street planning project, being managed by the Ann Arbor Downtown Development Authority, Smith did not want to tie the city’s hands on uses for the two lots. Mayor John Hieftje wondered what kind of uses Smith had in mind. 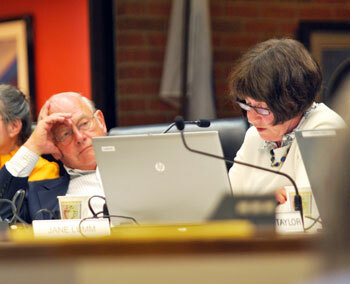 [Both Hieftje and Smith also serve on the DDA board.] Both areas Smith had identified are within the geographic scope of the Connecting William Street project. People had talked about ways to use the Palio lot as open space. Non-parking activity on the lots might “leak out” into the sidewalk, she said. She just wanted to leave options open for the city. 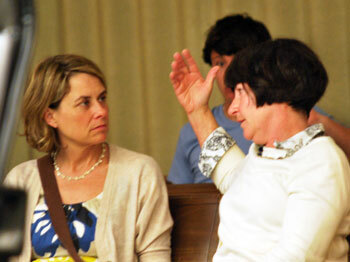 From left: Maura Thomson, executive director of the Main Street Area Association, talks with councilmember Jane Lumm (Ward 2). Maura Thomson, executive director of the Main Street Area Association, was asked to the podium to clarify. She described such a resolution as being on a “wish list” for the MSAA for a long time. She stressed that it would invalidate sidewalk permits only when the streets are closed – for specific events. Further, she said, it applies to sidewalk and peddler permits. For activity on the Palio lot or in the Fourth and William parking structure, she ventured that approval could be obtained from the DDA, but there’d be no sidewalk permit or peddler permit involved. Asked by Tony Derezinski (Ward 2) if Smith’s amendment impeded her, Thompson indicated she was mostly confused by it. When 7,000 people visit Main Street for Taste of Ann Arbor, she said, the more control over management she has in that area, the safer it is. The resolution is looking out for businesses that are open 365 days a year. She described how undesirable it would be for the owner of a bookstore, which contributes dues to the MSAA to help put on a special event, to have to watch a sidewalk peddler selling books in front of their bookstore. Stephen Kunselman (Ward 3) wondered if the DDA proposed some non-parking use of a public parking lot, whether the city council would have something to say about that. He was not sure that the DDA’s contract with the city, under which the DDA manages the city’s public parking system, allows for that. Smith indicated that she wasn’t at all opposed to the resolution. She was just trying to protect the city’s right to do something that it hasn’t thought about yet. She ventured that the DDA has no evil plans to take over the downtown for special events. Derezinski suggested that the DDA and MSAA get along pretty well and the two organizations could work out things informally if they needed to. Outcome on amendment: Smith’s amendment got support only from Smith. Sabra Briere (Ward 1) noted that the concept behind the resolution is to encourage people to frequent the businesses that are there year round, not just for an event. So she said she supported the resolution – because it might make a difference in how people spend their time and money when they go downtown for an event. Outcome: The council voted unanimously to approve the resolution invalidating sidewalk permits when Main Street is closed. After a public hearing held at the May 7 meeting, the city council considered a tax abatement for Sakti3 – a battery technology spinoff from the University of Michigan. Sakti3 is led by UM professor Ann Marie Sastry. A conversation during a May 7 council meeting recess, from left to right: Marcia Higgins (Ward 4), city administrator Steve Powers, Ann Marie Sastry of Sakti3, and Tony Derezinski (Ward 2). According to a staff memo accompanying the resolution, the abatement would be on $151,433 of real property improvements and $1,374,861 of new personal property. According to a memo from city financial staff, the value of the tax incentive to Sakti3 over three years totals $36,000. 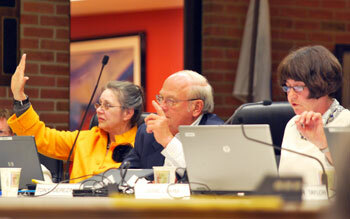 The council had voted to set the public hearing on the tax abatement at its previous meeting, on April 16, 2012. Reasons given in the staff memo for the abatement include the need for Sakti3 to expand and add new equipment for the continually changing alternative energy business and the expected addition of five new employees due to the firm’s expansion. The memo concludes that the retention and expansion of such operations is consistent with the economic development goals of the city of Ann Arbor and of Ann Arbor SPARK, the local economic development agency. Previously, the council voted on March 21, 2011 to set a public hearing on the establishment of the industrial development district under which Sakti3 is applying for an abatement. And on April 4, 2011, the city council approved the establishment of that district. The city is prohibited by state statute from abating taxes on any more than 5% of the total state equalized value of property in the city. Responding to an emailed query, city of Ann Arbor chief financial officer Tom Crawford wrote to The Chronicle that total SEV for the city for 2012 stands at $5,294,974,640, and the total SEV of abated property in 2012 is $8,935,974. That works out to 0.169% – well under 5%. Thomas Partridge asked that mayor John Hieftje ensure that there’s an introduction to every public hearing by having a councilmember or the city administrator explain the substance of the resolution, before asking people to come forward to speak about it. Partridge asked Hieftje if he would do that with the Sakti3 resolution. When Hieftje did not respond, Partridge told him that Hieftje’s silence spoke for itself. Hieftje then told Partridge that the city attorney had informed Hieftje that Partridge needed to stay on the topic of the public hearing. At that Partridge said he was then ready to speak specifically to the requested tax abatement. Partridge said that Sakti3 and other companies need to justify their request, and he opposed the resolution – unless the company agrees to terminate the exemption when it can find finances on its own. He also warned that we should be cautious about battery manufacturing, due to the toxic chemicals that are used. Marcia Higgins (Ward 4), who chairs the council’s budget committee, asked that the tax abatement request be postponed, until it could be reviewed by the budget committee. Tony Derezinski (Ward 2) stressed that there would be an expedited meeting of the council’s budget committee [on Wednesday, May 16 at 5:30 p.m.]. Sakti3 had developed a whole new technology, he said, and was quite worthy as a candidate for a tax abatement. He noted that representatives of the company had been present earlier in the meeting. He said he’d like to show Sakti3 the council’s ability to act quickly. Jane Lumm (Ward 2) appreciated Higgins’ request to postpone. Lumm said an analysis had been provided to her on the impact of the abatement, and the city of Ann Arbor actually does very little of this. She felt postponing was fine. Outcome: The council postponed the tax abatement for Sakti3 until its May 21 meeting. There were several separate resolutions to approve street closings for special events. Mayor John Hieftje said he would lump them all together for one vote, unless someone objected. Sandi Smith (Ward 1) wanted separate consideration of a request from the University of Michigan law school to close Monroe Street for its dedication weekend, Sept. 7-8, 2012. Smith indicated that she did not have an objection to the Monroe Street closing – that was not the reason she was requesting separate consideration. She wanted to highlight the fact that UM would like it closed on a permanent basis. Instead of a permanent closing, she said, she’d prefer to see requests for closing come before the council for specific occasions. Tony Derezinski (Ward 2) – who’s a UM law school alum and has served as an adjunct professor at the school – responded to Smith by saying he loved part of her sentiment. [Derezinski has worked out of public view to facilitate a permanent granting of the public right-of-way on Monroe Street to the University of Michigan. See Chronicle coverage: "Column: Ann Arbor's Monroe (Street) Doctrine"] He highlighted the fact that the dedication would be attended by Elena Kagan, justice on the U.S. Supreme Court. 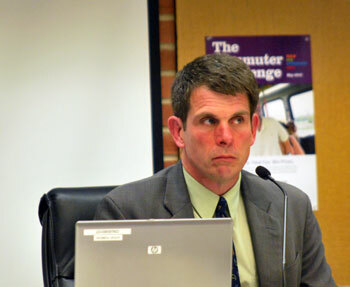 During the final opportunity for public commentary at the meeting, Thomas Partridge suggested that when Kagan comes to Ann Arbor for the dedication ceremony, she should take cognizance of the willful disregard for justice here locally, and the total disregard – during an historic recession – of the needs for the most vulnerable, and for working residents who actually keep Ann Arbor operating on a day-to-day basis. Outcome: The council unanimously approved the Monroe Street closing, along with all the other street closings on the agenda. The council had on its agenda an item to approve a $206,900 contract with the E.T. MacKenzie Company for a project to reconstruct Willard Street, using permeable pavement. It’s a 21-foot wide, 700-foot long street that runs between East University Avenue and South Forest Avenue. The project covers replacement of curb and gutter, sidewalk ramps and installation of a permeable asphalt pavement. The general topic of street repair was discussed by the council early in the meeting, during communications time. Mike Anglin (Ward 5) wondered about Madison Street from Seventh to South Main – when would it be resurfaced? He felt that there could be more deterioration on streets where public buses travel due to vehicle weight. He felt that the buses are an important service, but could also be an annoyance, because of the impact they have on roads. Back and forth between mayor John Hieftje and Homayoon Pirooz, head of project management, indicated Madison is in very poor condition, so it needs to be rebuilt from scratch – which would take a whole summer. The city is also resurfacing Seventh Street, and Madison is serving as a detour, so it’s a coordination problem, Pirooz said. But Madison is definitely on the list for 2013, he said. Stephen Kunselman (Ward 3) said he thought that Madison had been done within the last 10-15 years – why is the city doing it again? Pirooz was not sure when the last time Madison had been reconstructed. He told Kunselman it’s possible it was just resurfaced, not rebuilt. Kunselman wanted the documentation on that. He picked up on Anglin’s comment about buses, by saying it’s also the bigger city trucks that are causing more rapid deterioration. The road along Madison is sloughing downhill, he said. Pirooz pointed out that resurfacing alone doesn’t help the road base. When the council came to the Willard Street reconstruction, Kunselman questioned city engineer Nick Hutchinson about the cost of permeable pavement compared to regular pavement. Hutchinson indicated that the cost of the asphalt itself is about 1.5 times regular pavement; however, given the complete reconstruction required, the cost of the permeable asphalt as a component made the project more expensive – but not 1.5 times as expensive. Hutchinson reviewed the number of permeable pavement installations in the city: (1) Easy Street, which has permeable pavers lining the sides; (2) Sylvan Street; (3) an alley in Burns Park; and (4) Willard Street. Kunselman noted that University of Michigan buses run for one block on Willard – how does permeable pavement hold up under heavy weight? Hutchinson said he believes the pavement will hold up very well – it’s designed in a heavy duty way. Kunselman wondered if permeable pavement might last even longer than traditional pavement, because there’s less freeze-thaw. Water drains through the courser material instead of being trapped inside it. Outcome: The council unanimously approved the Willard Street permeable pavement project. Michael Benson introduced himself as a Ward 2 resident. He thanked the council for placing all the documents online. Ranzini said that while the firefighters responded in a timely way, they were not able to bring the tower truck or ladder truck to reach upper stories, because the trucks are currently out of repair. As a result, he contended, firefighters and residents were placed in harm’s way. Ranzini called for the budgeting and hiring of 88 firefighters, not just the 82 in the currently proposed budget – of which only 76 positions are now actually staffed. Commenting on a proposed new station model for the department [which would use three stations instead of the current five], Ranzini cited a poll by AnnArbor.com that indicated overwhelming opposition to the three-station model. Rather than continuing to study that station model, he called on the city council to hire the full complement of firefighters who are budgeted, add six additional firefighters to this year’s budget, and replace or repair the tower truck and the ladder truck. He described the current staffing levels as an “experiment with public safety” by the mayor. Ranzini said he knew about the fire on April 29, not because of the fact that he was nearby, but rather because he’d received an anonymous communication from a firefighter. That communication was anonymous, he contended, because the fire chief has ordered firefighters not to talk to the press. Ranzini indicated that the executive director of the ACLU of Michigan has told him that if the city administrator does not correct that situation, a lawsuit might ensue. Every city council agenda contains multiple slots for city councilmembers and the city administrator to give updates or make announcements about issues that are coming before the city council. And every meeting typically includes public commentary on subjects not necessarily on the agenda. Nanci Gerler and Darren Schmidt had also addressed councilmembers on the topic of “smart meters” at the council’s April 16, 2012 meeting. Gerler told the council that five other communities in Michigan have passed resolutions and bans on smart meters and she called on the Ann Arbor city council to do the same. The current installation by DTE Energy is going rapidly, she said, with 30 trucks working six days a week. She contended that DTE is not maintaining a list of opt-out requests. She went on to describe that many residents haven’t received notification or a knock on the door to alert them of the installation of the meters. Installation has occurred over people’s protests, she said. The utility company has accepted no responsibility for people’s health, she said. Schmidt said he supports a halt to installation of smart meters. He described several patients with a history of symptoms that are hard to get rid of. After stumbling around looking for solutions, he said they found that many of their symptoms could be attributed to electromagnetic fields. While it’s possible get rid of other consumer wireless devices, people can’t get rid of smart meters, he said. David Foster told the council he lives in the Lansdowne neighborhood a few houses down from the Fisher family, who’d addressed councilmembers at the council’s April 16, 2012 meeting. He described how his own house had received severe water damage during the March 15 storm. He described how there’d been a “river effect” on the streets, rendering them impassable. On the west side of his house, he reported, the water had flowed up over some block and into the basement egress window – a window that is required by the city. His basement had water seven feet deep, he reported. He noted that he’s 5-10 and his son is 4-2 – so the water would have been well over their heads, if they’d been home at the time. And they would have been in the basement, he said, because they’d have been seeking shelter from the tornado. He asked that the council acknowledge that a problem exists. It’s not a question of whether similar events will occur in the future – it’s a question of when, he concluded. Responding to Foster’s comments, Jane Lumm (Ward 2) wanted to know if there could be an update on the meetings that Marcia Higgins (Ward 4) indicated had taken place between residents and city staff. Higgins, who represents the ward where this localized flooding is located, told Lumm that staff are still analyzing the situation and that there’s nothing ready to report yet. Thomas Partridge introduced himself as a Democrat and grandfather and a resident of Ann Arbor and Washtenaw County – an advocate for those who can’t attend the meeting, the vulnerable people who are disconnected from the multimillion-dollar projects on the agenda. He called on the council to advance human rights, and public transportation, to give priority to the need to end homelessness and poverty and to provide access to expanded shelters, transitional housing and permanent housing. That should take precedence over talk about art commission projects, he said, which are unnecessary to the cause of human rights. Kermit Schlansker opened by telling the council that every furnace now being sold is obsolete. He observed that heat is a byproduct of making energy, so furnaces could manufacture energy while generating heat. He described the process of “co-manufacturing” heat and energy. Henry Herskovitz said that the report that the director of the Interfaith Council on Peace and Justice had entered the race for the Ward 5 seat on city council had come as a shock to members of the former ICPJ Middle East task force. [Herskovitz didn't name the director, but he was referring to Chuck Warpehoski.] Under the leadership of Warpehoski, Herskovitz said, the task force was summarily disbanded by the ICPJ’s board of directors. The task force had voted unanimously in 2006 to support the Palestinian call for boycotts, divestments and sanctions against Israel. Herskovitz attributed the disbanding of the task force to a few powerful supporters of Israel on the ICPJ board of directors. The task force, Herskovitz continued, had sought to resolve the dispute with outside professional mediation. Herskovitz characterized the board’s action, supported by Warpehoski, as overrunning democratic procedures. Voters in Ward 5 deserve representation by someone who embraces democratic ideals, Herskovitz concluded. Present: Jane Lumm, Mike Anglin, Sabra Briere, Sandi Smith, Tony Derezinski, Stephen Kunselman, Marcia Higgins, John Hieftje, Christopher Taylor, Carsten Hohnke. The Chronicle could not survive without regular voluntary subscriptions to support our coverage of public bodies like the Ann Arbor city council. Click this link for details: Subscribe to The Chronicle. And if you’re already supporting us, please encourage your friends, neighbors and colleagues to help support The Chronicle, too! I have two separate comments. One is concerning the sculpture in the Justice Center lobby, and first let me state that I fully support the 1% for art. I wasn’t all that impressed with the sculpture when I first saw images but I can get on board if everyone else seems to like it. Then I started seeing variations on that damn sculpture everywhere I travelled. I first saw one at RDU (Raleigh-Durham airport) as I commented elsewhere. Then I saw one at the Houston airport, then at McCarran (Las Vegas), and finally last week in Phoenix at the PHX car rental place. I now expect them in each new airport I enter. These Ed Carpenter glass sculptures are becomming ubiquitous and corporate-feeling. Not exactly the image for public art in Ann Arbor that was envisioned, I’d bet. Second comment is about street repair. Is there any connection between utility repair work (when done in the street) and city street engineering? I raise this question because there are several streets in my neighborhood that have been recently resurfaced or reconstructed and they ended up beautifully done. On each street, portions were subsequently dug up for utility repair then patched. Every one of the patches has sunk and created real driving hazards on these roads. It is clear that whoever “repairs” the street after utility work isn’t following the original construction details and it is causing quick deterioration of the streets. Far quicker than the weight of trucks/busses I would imagine. Thanks for that, Marvin. I followed the link to the piece at RDU, and oy: “The sculpture creates triangular forms that suggest the Research Triangle Region.” Is that the quality of thought that goes into these pieces? I agree, they’re pretty bland and corporate feeling–in a previous post I referenced the kind of sculpture you see in malls. The cuts you see in recently resurfaced roads are usually not cuts made by the City – they are more often private utilities (gas, electric, etc.) or private contractors. Once a street is resurfaced or reconstructed, it goes onto a “Street Cut Moratorium” list, which means the street is not supposed to be cut for a certain number of years (the number of years depends on the classification of the road: arterial, collector, etc.). That said, if a gas main is leaking, or someone’s sewer lead fails, it obviously needs to be dug up and repaired. When a contractor applies for a permit to do such work, it is checked against the Street Cut Moratorium, and if it appears on the list, the entity requesting the permit needs to justify its necessity, so we can try to avoid as many such cuts as we can. Sometimes such cuts are patched temporarily to maintain traffic on a street until the permanent patch can be installed by a paving contractor (this is particularly true in the winter when asphalt is not available). While it is usually the case that a patch in a street will not be as good as the surrounding pavement, if there is a particularly rough patch, or one that has been in place for a while and has not yet received a permanent repair, they should be reported to our department so that we can make sure the contractor responsible completes or corrects their work.